A friend lamented to me recently, “The whole world seems upside down. What should be considered bad is now good, and vice versa.” He went on to detail how laws of economics are violated domestically, expecting an outcome different than the natural law of cause and effect would dictate. I concurred with him, and found myself reflecting on some of the wisdom of yesteryear that is ignored, thought impertinent to a new “enlightened” era, or not applicable to our advanced society. Certainly some of the challenges facing our nation and our society currently can be seen through the lens of proven wisdom. In this light I thought I’d pick a few of those nuggets of anecdotal verity that have been validated by history to provide a little sagacious insight for the context of what our politicians have been inflicting upon the nation. 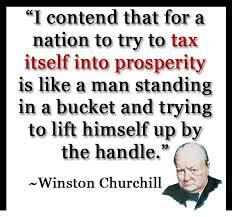 The “great communicator” Ronald Reagan, observed the practices of government, and summarized, “Government’s view of the economy could be summed up in a few short phrases: If it moves, tax it. If it keeps moving, regulate it. And if it stops moving, subsidize it.” If that doesn’t capture the mindset of our government over the past several years, I don’t know what does. 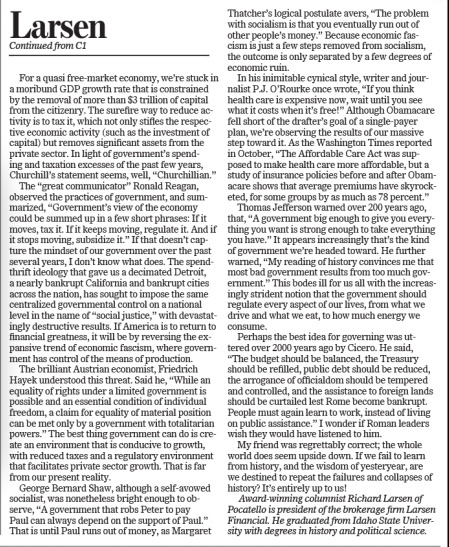 The spendthrift ideology that gave us a decimated Detroit, a nearly bankrupt California, and bankrupt cities across the nation, has sought to impose the same centralized governmental control on a national level in the name of “social justice,” with devastatingly destructive results. If America is to return to financial greatness, it will be by reversing the expansive trend of economic fascism, where government has control of the means of production. 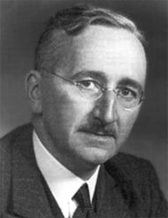 The brilliant Austrian economist, Friedrich Hayek understood this threat. Said he, “While an equality of rights under a limited government is possible and an essential condition of individual freedom, a claim for equality of material position can be met only by a government with totalitarian powers.” The best thing government can do is create an environment that is conducive to growth, with reduced taxes and a regulatory environment that facilitates private sector growth. That is far from our present reality. George Bernard Shaw, although a self-avowed socialist, was nonetheless bright enough to observe, “A government that robs Peter to pay Paul can always depend on the support of Paul.” That is until Paul runs out of money, as Margaret Thatcher’s logical postulate avers, “The problem with socialism is that you eventually run out of other people’s money.” Since economic fascism is just a few steps removed from socialism, the outcome is only separated by a few degrees of economic ruin. Thomas Jefferson warned over 200 years ago, that, “A government big enough to give you everything you want is strong enough to take everything you have.” It appears increasingly that’s the kind of government we’re headed toward. He further warned, “My reading of history convinces me that most bad government results from too much government.” This bodes ill for us all with the increasingly strident notion that the government should regulate every aspect of our lives, from what we drive and what we eat, to how much energy we consume. Perhaps the best idea for governing was uttered over 2000 years ago by Cicero. He said, “The budget should be balanced, the Treasury should be refilled, public debt should be reduced, the arrogance of officialdom should be tempered and controlled, and the assistance to foreign lands should be curtailed lest Rome become bankrupt. People must again learn to work, instead of living on public assistance.” I wonder if Roman leaders wish they would have listened to him. My friend was regrettably correct; the whole world does seem upside down. If we fail to learn from history, and the wisdom of yesteryear, are we destined to repeat the failures and collapses of history? It’s entirely up to us!